Brakes rounded off a positive opening week of the season by sending league newcomers Hayes and Yeading United to defeat in the first Saturday fixture to be played at their new SkyEx Community Stadium, writes Paul Edwards. Jack Edwards scored the only goal with six minutes played, stealing in unchallenged at the far post to head in Rob Thompson-Brown’s lofted left-wing free-kick. The hosts attempted a quick response but Jack Mills could only fire a free-kick straight into the arms of Tony Breeden. His defensive colleague Yannis Ambroisine almost passed the ball into his own net under pressure from Ryan Rowe, forcing keeper Louis Wells to scramble back and clear. Ahmed Obeng then saw a shot deflected over the bar from Thompson-Brown’s corner. Courtney Baker-Richardson came close to adding a second for Leamington, turning on to Connor Gudger’s ball forward and rifling a low drive just past the post from distance. This was the last real effort either side had on goal during the first half, the game providing little excitement for the crowd of 265, among which there was a healthy visiting contingent, boosted by a small group of SV Eichede fans who travelled over from Germany for the game. Hayes and Yeading came more into the game in the second half, but Leamington were proving hard to break down. Dylan Kearney latched on to a loose header from James Mace to volley well wide, while Karnal Guthmy managed to evade the attentions of Obeng to crash another effort off target. Mickey Lewis threw on two of his substitutes in an attempt to change the game and one of them, Ismael Ehui, could only fire straight at Breeden after Kearney’s turn and shot had fallen to him. 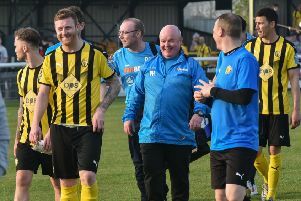 Edwards tried his luck from a tight angle as Leamington tried to stem the frequency of the hosts’ attacks but his shot lacked the power to trouble Wells. Rowe then held the ball up well on the right to allow Ben George to run in and see a shot blocked. Hayes and Yeading broke quickly from the resulting corner and Lloyd Macklin found himself in a good position on the right of the Leamington area but blazed his shot over. The game was opening up more now and the hosts threw on giant striker Melford Simpson to give Brakes a new problem to deal with. However, Leamington broke away as Kearney mis-kicked inside their penalty area, Thompson-Brown running almost the length of the pitch before setting up Rowe to fire over. Macklin almost muscled his way through on goal but was held off well by Jamie Hood, who nudged the ball back to his goalkeeper. It was pretty much one-way traffic now as the home side desperately searched for a way through. Yasin Moutaouakil fired a free-kick high over from a promising position, while skipper Adam Everitt drove just wide after Breeden had punched a cross off the head of Simpson. Jack Mills then stepped up to try his luck with a free-kick, his shot deflected behind for a corner. Deep into what seemed to be an inordinate amount of time added on the hosts were awarded another opportunity from a dead ball, again from a good position 20 yards out. This time Kearney stepped up and fired in a low effort but Breeden was right behind it, pushing the ball out to safety. The final whistle sounded as the clearance was completed, enabling Leamington able to celebrate a third successive maximum. Hayes and Yeading United: Louis Wells, Jim Fenton (Melford Simpson, 71), Yasin Moutaouakil, Jack Mills, Yannis Ambroisine, Harold Joseph, Dave Olufemi (Ismael Ehui, 57), Adam Everitt, Lloyd Macklin, Dylan Kearney, Karnal Guthmy (Matt Sinclair, 57). Subs not used: Mo Otuyo, Colin Mugoya. Brakes: Tony Breeden, Ben George, Connor Gudger, Darren Pond (Richard Taundry, 71), Jamie Hood, James Mace, Courtney Baker-Richardson (Lee Moore, 60), Jack Edwards, Ryan Rowe, Rob Thompson-Brown (Rob Elvins, 83), Ahmed Obeng. Subs not used: Joe Magunda, Tom James.